Confirming and exploding stereotypes about the elderly all at the same time, Stephen Walker’s documentary about the cutting-edge Northampton, Massachusetts seniors’ chorus can be cloying now and then, but quite sincerely so. It is also often quite seriously funny, full of verve and life, and painfully honest about the mortality of its likable senior-citizen singing stars. Young@Heart was formed in 1982, drawing its singers from residents of an elderly housing project in Northampton. General mastermind Bob Cilman was one of the chorus’ founders and continues to be its arranger, conductor, and executive director. Playing in a variety of bands since he was a preteen and with a peculiar taste and sense of ironic humour, Cilman is not content to choose Bacharach ballads or showtunes for the group’s performances. He leans towards contemporary rock, pop, or even hip hop hits, often selecting songs that draw out certain qualities in his performers or invert the meanings or implications of lyrical content when sung by a gaggle of old folks. 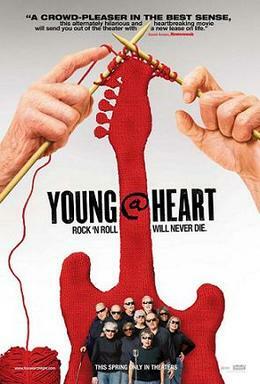 He also struggles through Walker’s film to find a balance between the band director’s tendency to demand excellence from his performers and his particular challenge of recognizing and dealing with the physical (and sometimes mental) limitations of his chorus members, who average an age of eighty years young. Health and mortality are perhaps the greatest obstacles facing Young@Heart, understandably so when its ranks are filled by people near the end of long, full lives (none of its original members are still alive, and even many from this film have passed, too). The pathos and drama of illnesses and deaths of the chorus’ members underscores the scenes of rehearsals, music videos, and live performances. The grim reality of old age which the chorus seeks to rise above threatens the viability of performances but eventually imbues them with a deep emotional resonance. It’s a pat observation to call these performances “inspirational” (and what does that mean, anyway? ), but what else can you call the chorus’ moving version of “Forever Young” at a prison? Multiple social barriers and life-limiting sentence collapse in those moments. It’s a profound thing. And really, what isn’t there to like about 22 octogenarians singing Sonic Youth’s “Schizophrenia”, or sending up retirement home zombies with the Ramones’ “I Wanna Be Sedated”? Even Coldplay’s monument to heart-tugging namby-pambiness “Fix You” becomes a climactic, cathartic hymn to togetherness and empathy when sung by Air Force vet Fred Knittle, hampered by an oxygen tank but blessed with a deep, rich baritone voice. He personifies the spirit and artistic angle of Young@Heart, beautifully documented in this film: worn down by the years but lifted up in song.